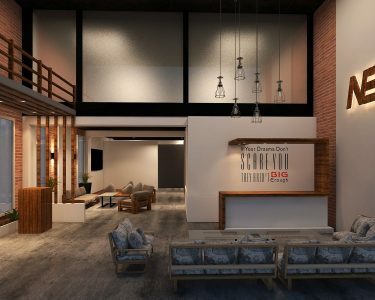 Office design is a significant branch of interior design and a popular market for Interior Designers in Lahore. Our Architecture Firm, Archicubes aims to become the Best Interior Designer in Lahore for such projects. Our intention is to come up with spaces which actually leave an impact on the minds of its dwellers, psychologically. It’s a fact that the design of a space can effect the mood of its inhabitant. An office requires such attention to the detail and spatial arrangement, so that we get much more productivity in people who spend more than half of their day in that space. This office is designed on contemporary lines and means to provide a warm work environment in which the dwellers could feel a sense of belonging and interact on an informal level with their surroundings. 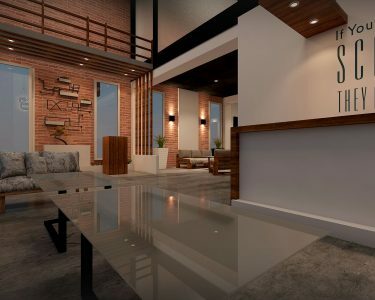 The entrance into a double height space, which serves as the waiting lobby, gives a spacious vibe to the office. The use of brick for the tall walls adds colour to the otherwise neutral mood of the space. Wooden furniture against the concrete floor finish provides a serene contrast, along with that a touch of black colour helps the space establish the intended elegance to the design. 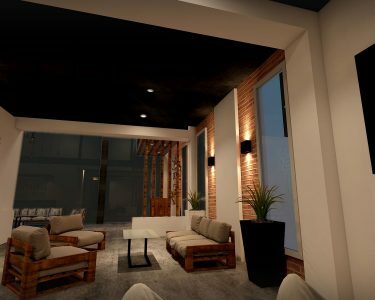 Black ceilings are an unsual sight, their addition to the space brings a certain uniqueness to the environment. The much modern interior is made even more welcoming by the apt placement of various plant pots. Such traces of vegetation set a tranquil mood for the space which provides a comfortable platform for a creative team to work in. The main space of the office, director’s room, is located on the top floor and is accessible from an overhead bridge that is view-able from the waiting lobby also. This adds a sense of power to the space and responds to the discipline of hierarchy that exists in an office. The lower floor consists of a waiting lobby, reception, media room and a conference hall. All these spaces are integrated together in a manner that it seems like one big space.